Here is the link to AL Live's April 18, 2013 video, featuring the always astute Sue Polanka, EBSCO's Scott Wasinger, and me. It's all a pretty good snapshot of the issues at this moment. The discussion is an hour long, so be prepared. Sue asked some great questions. One of them got me to say something I hadn't prepared ahead of time: that in an age of abundance of literature, not scarcity, libraries are not gatekeepers. We are gardeners, working to grow the fresh local produce of creators. The more I think about that image, the more I like it. Thanks to AL Live's Dan Freeman, Sue, and Scott (EBSCO was the sponsor of the show) for the opportunity. Suzanne bought me a Nexus 7 for our anniversary (thank you!). The 7 stands for 7 inch screen. 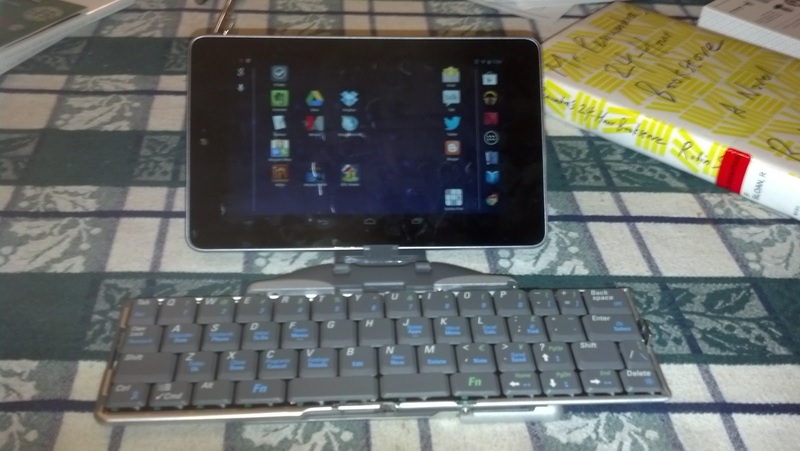 It is wonderfully light, fast, comfortable to hold, easy to read, and easy to type in (with Swype or thumbs). 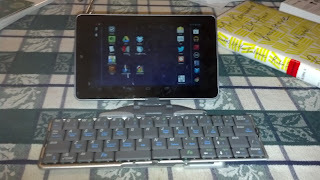 But on a lark, I remembered the bluetooth fold up keyboard I bought years ago for my Palm Pilot. With a few new batteries, it works just fine with the Nexus. So here's a picture of a really tiny portable computer station. I put the edge of a book next to it so you could see relative size. I'll take the combo with me on my next trip to see how it works. Real leadership begins with listening. In so many spheres -- the public sector, the not-for-profit, and the private -- leadership isn't some kind of machine-gun decision-making. Rat-a-tat-tat, do this, do that. Real leadership begins with listening, with the inherent humility of a question. The purpose of leadership is to make meaning. It's to identify what matters, then to start assembling the human resources to focus on that issue. Then, by harvesting the "wisdom of crowds," leaders do something breathtakingly simple. They make things better. I think much of the frustration of our times, when so few people trust either elected leaders or CEOs, is just that these so-called leaders are so full of themselves, so arrogant, that they've stopped listening. And so they stop learning. Many people seek power and authority. But neither confers wisdom.